Canton Town Hall is located at 1150 Canton Center Road South, Canton MI 48188; phone: 734-394-5100. Photo: Thomas and Maria Blackman Bartlett House, 500 N. Ride Road, Canton, MI. Listed on the National Register of Historic Places in 2000. Photographed by user:Andrew Jameson (own work), 2010, [cc-by-3.0 (creativecommons.org/licenses/by/3.0)], via Wikimedia Commons, accessed August, 2013. Canton Township was incorporated in 1834. Canton's beginnings coincide with the opening, in 1825, of the Erie Canal. With the canal settlers had a direct route to Michigan Territory. They were able to travel along the canal to Lake Erie and then by steamer or sailboat across the lake to Detroit and Monroe. A national road, the second funded by the U.S. Congress, led them into the interior. This road, the Chicago Road, cut through the lower sections of Canton Township. Thousands of settlers used this route and Sheldon's Inn in Canton Township was a popular stopping place the second night out of Detroit. As settlements were established the Michigan Territorial Government funded other roads to connect the communities. Present day Geddes Road was originally the South Territorial Road laid out in 1834 to connect Ann Arbor with the Chicago Road and Detroit. Its point of beginning was on the Chicago Road near Sheldon Corners. Timothy and Rachel Sheldon came from New York, and purchased the land in June of 1825. 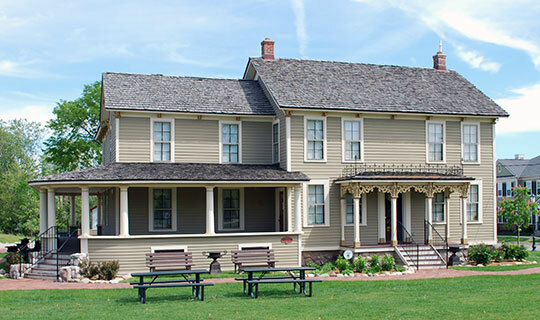 On their property they built the Greek Revival home that came to serve as a post office and as a stagecoach inn. Another transportation route also led early settlers into Canton. Running from the Chicago Road on a diagonal northeasterly from near Ypsilanti is "The Ridge." Cutting through Canton's western sections it is part of an extensive geological formation, 400 miles long, which marks the beach line of glacial Lake Whittlesey. The natives used this high ground as a trail. Settlers followed the native trail and finding water and good farmland settled along the route. Several farmsteads were located on the "Ridge" in 1838 when Beta Hubbard, working as the state geologist, surveyed Canton Township. His field notes indicate that he talked with Mr. Braford, whose Greek Revival house is one of the nominated sites. Other houses in the nomination are located on the "Ridge." The Bartlett/Travis House and the Kinyon House both mark the early settlement along this route. Census records show that most of Canton's original settlers were from New York, Vermont or England. They brought with them the Greek Revival style of architecture, popular in New York, and modified its typical forms to suit their needs on the frontier. They established farmsteads where they practiced mainly subsistence farming. A second wave of settlers arrived in Canton in the second half of the nineteenth century. Political and social troubles in central Europe, beginning in the early 1840's and continuing until the end of the century brought many German immigrants to Michigan. They established successful farms and built dynasties that made names like Hasselbach and Lohr common in Canton Township. One of the early German immigrant farmers in Canton Township was Michael Fischer of Wurttemberg who immigrated in 1847 at the age of 14. His family prospered and eventually his son built the large cross-gable house listed in the nomination. Following the German immigration Canton's population remained relatively stable. By the end of the nineteenth century many families had lived for three generations on their farms and created dynasties that continue in Canton to the present. The story of these families' success and the story of Canton's development as a successful farming community is evidenced in the succession of homes they built. The first homes they built were log homes, then Greek Revival houses, and later larger more modern homes. Farming provided a good living, and the increasingly larger and more modern living quarters reflected this. In this nomination the Smith House (1904) and the Patterson/Gilmore House (1897) are both homes of such Canton dynasties. The township remained mostly rural until the opening of I-275 in 1977. Kosky and Glynn Associates, Historic and Architectural Resources of Canton Township, nomination document, 2000, National Park Service, National Register of Historic Places, Washington, D.C.